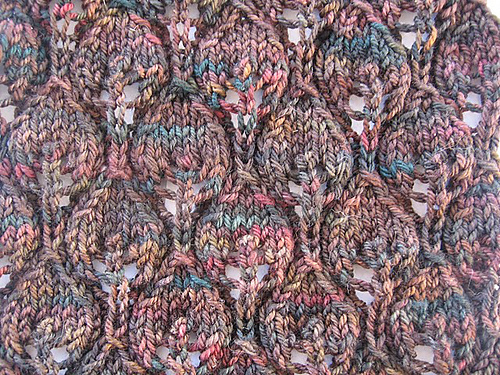 Since there hasn’t been a whole lot of new knitting going on and nothing interesting to show you (turns out shawls look pretty much the same as they progress until you reach the edging, just a slightly larger triangle…) I thought I’d feature an older project that I dug out and wore recently that deserves some love. I’m not usually a ‘brown’ person, although I’ve been told it’s a good color on me, but this particular colorway was gorgeous and perfect for this leafy pattern. It used to be a standard colorway available at The Sanguine Gryphon but alas, no more. It was highly variable, though, so you really had to catch just the right skein otherwise it was too orange-y or muddy or just not to my liking. I liked it with lots of the deep reds and greens and I lucked out with my skein. The pattern is the Woodland Shawl by Nikol Lohr, available for free on Ravelry. It is a lovely, simple knit. The repeat is easy to memorize after a few times and it becomes nice and meditative. I cast on 53 stitches and added a bit of 1×1 ribbing to both ends. I used the entire skein to get a good size scarf (8″ wide, 63″ long) and I used a few grams of coordinating colorways (Cowkiller and Autumn Tiger Beetle, the red and green) in the fringe. This was finished last March. I don’t wear it nearly as much as I should, but whenever I do have something brown to wear I pull out this scarf. 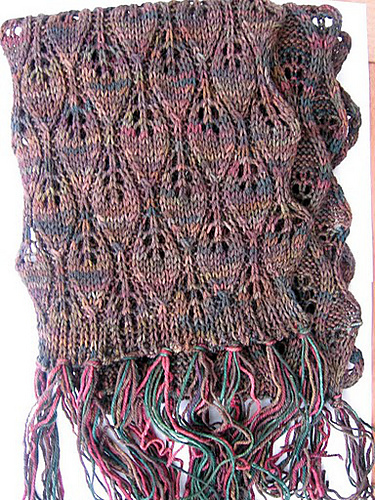 Hmm, I think I just talked myself into knitting another simple lace scarf out of Bugga. Any ideas? This entry was posted in Bugga, OldieButGoodie, scarves by shoelaceswitcher. Bookmark the permalink.